The Dickies KHAKI Collection is your everyday go-to-performance pant. Its comfort, durability, and versatility take you from work to weekend. Whether you're punching the clock or brewing your own beer, Dickies KHAKI has you covered. The history of the Khaki pant is as rugged as the fiber it's made from. In fact the word Khaki is derived from the Persian word Khak meaning soil. This durable and versatile fabric was first adopted as a uniform by the "Corp of Guides" an Indian regiment serving in the British Army in the early 1800s. In fact the success of the unit and its unique uniform quickly spread through the British Empire and was eventually made the official British Military uniform. As was the case with the British Army, the Khaki also became a staple of the U.S. Military and during World War II, Williamson-Dickie MFG, Co. produced over 9 million Khaki uniforms for U.S. Service men. This strong relationship with servicemen and workers alike ensured the Dickies KHAKI trouser would have a home after the war in the oil fields of Texas and the Middle East, as well as the office and the factories of U.S. Industries. Designed exclusively for the modern professional, we've updated the timeless Khaki look with contemporary style and enhanced softness. 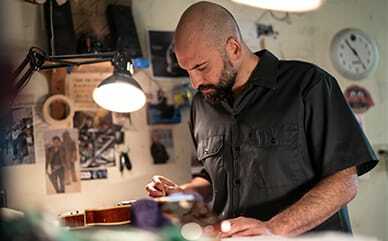 Premium cotton blends, modern fits, technologically advanced fabrics, and legendary Dickies craftsmanship make these hard-working pants the favorite of hard-working professionals. 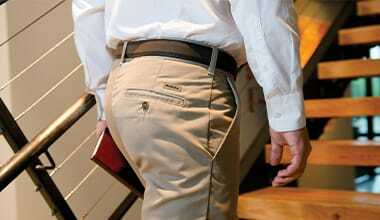 Whatever the day may throw at you, trust Dickies KHAKI pants to handle it in comfort and style. 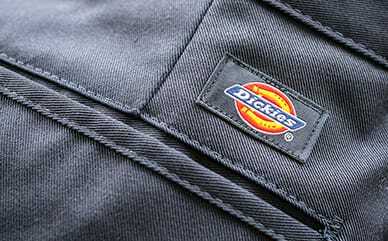 Dickies KHAKI fabric is the perfect blend between the softness of cotton and the quality you expect from Dickies. This pant is a blend of premium cotton that's ringspun for softness and durability and Repreve polyester from recycled plastic bottles. The midweight fabric is also brushed and garment washed for additional comfort and year-round wear. The Dickies KHAKI pant will soon become your go-to pant for the work week. Built with cotton rich performance fabric and in modern fits, this pant delivers with both wrinkle and stain release features that are designed for easy movement and all day comfort. Repreve fiber contains recycled materials including plastic bottles*. When you see this symbol on the label, remember: It's what's in it...that makes it recycled. With Repreve, you can be sure you're creating a reprieve for the planet. The versatility of Dickies KHAKI makes it the go-to pant by providing an easy transition for meeting friends after work, a special dinner, or just hanging out on the weekend. The classic styling, multiple fits and full range of colors offers many choices for any situation. * Except Repreve nylon, which is made from post-industrial waste. Learn more about how the plastic bottles are used in the making of the Dickies KHAKI pant.